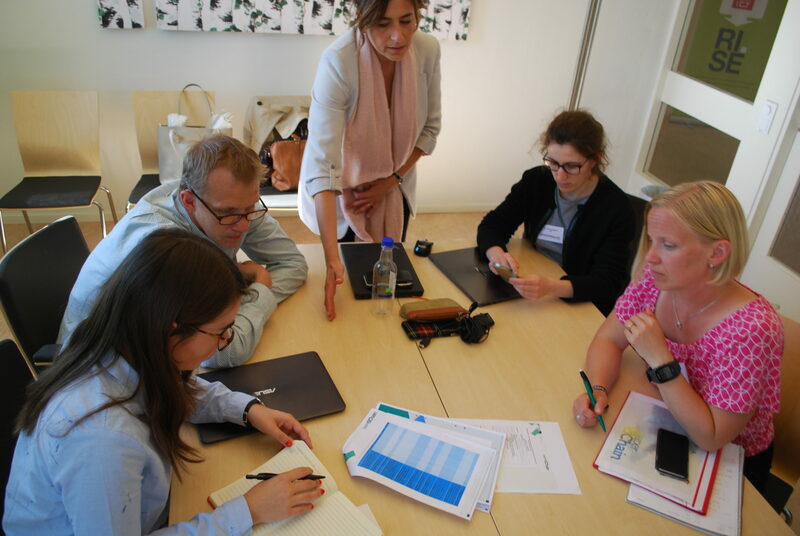 During the 30th and 31st of May, the PaperChain project held its second General Assembly in the Swedish city of Örnsköldsvik, hosted by Processum. In order to take advantage of the meeting in an efficient way, once concluded the General Assembly, two additional workshops were held during the 31st of May and the 1st of June, 2018. Likewise, both of these workshops were hosted by Processum. First of them, named “Discovering novelty on the circular economy models in PPI” was led by our partners Tecnalia and LGI and celebrated during the evening of the 31st of May. Second one, named “Transition Assessment” within the Work Package dedicated to Exploitation and Replicability was led by LGI, on the 1st of June, 2018. Both workshops were attended by all the partners involved and forming the Swedish branch of Paperchain within the Circular Cases 4 and 5. Workshops were conducted by LGI and Tecnalia and supported by Acciona, Gaiker and Greenize. In terms of participation, practically all the partners of the consortium attended this event and all of them were really inclined to answer the questions formulated. According to Camille Auriault, Innovation Strategist from LGI “They were patient with us, providing us information to understand how the circular case worked (very complex).They were willing to share their knowledge and took these workshops seriously. All the partners listen to each other, completing someone else’s answer if needed. All of them collaborated with a very open attitude”. Amaia Sopelana, from Tecnalia Rehabilitation and Integrated Urban Regeneration, commented about the progress of the project “This first year of the Project has served to put in contact all the partners and to achieve a common understanding of PaperChain’s objectives and how important the challenges of the project are. In terms of technical progress, most of the tasks are evolving as expected”. “With regards to the Work Package related to the Design of novel circular economy models, we are nearly to figure out the five circular economy models and their components that will assure success to operationalise them. These five designs will be updated as far as their technical and quality feasibility are achieved by the end of the project”. Affirmed Amaia Sopelana, from Tecnalia. “The next steps concerning to the Work Package related to Exploitation and Replicability is the facilitation of two other workshops in Slovenia and Spain corresponding to the Circular Cases 3 and 4, in June and early July”. In a longer-term view, the rest of these WP will be dedicated to prepare the “after-project”. So we will elaborate exploitation strategy for all the partners and we will assess the replicability of the circular economy models”. In the words of Camille Auriault, from LGI. From these lines, the whole Consortium wants to thank Processum as model host, always attentive to their hosts.